Found this sheet of sort of cardboard-y paper in my files. After my recent 1941 Whatman experience, I wondered whether this was one of my better types of paper (it was stored away, and did have “deckled” (ie. neatly torn) edges). It might have been Arches Cold Rolled, or some such thing. So I stretched it, and it became obvious then it was Dollarama cardboard. Still, I painted on it. I like using cheesy materials, because then I feel the pressure is off. This didn’t take long. I don’t do studies or tracing very often, at least for these nonce paintings. Just drawing by eye, and hoping it all is straight and fits in. I call it my “I can do no wrong” style of painting, because that’s what I’m telling myself as I do it. Worked out here, but the cars are a little big. I’m calling that “perspective.” That’s me in the lower right-hand corner. 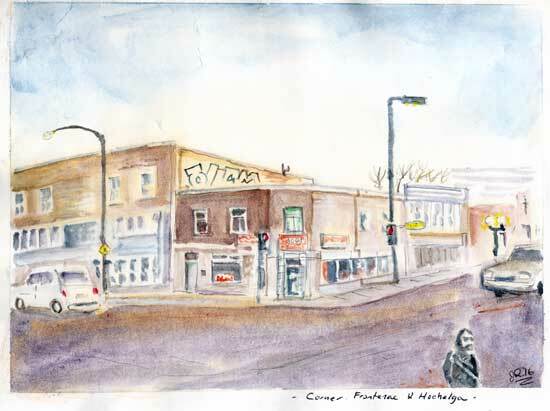 This is the corner of Hochelaga and Frontenac streets. The business used to be Fontana Pizza, which was owned by a very nice man. 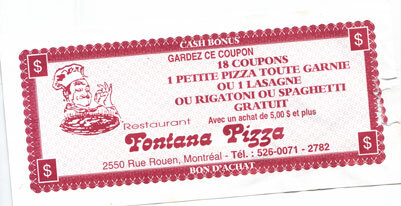 Unfortunately, his pizza ended up being a little rich for my digestive tract, but I still have a few Fontana coupons. You collected ten of them, and got a free pizza. Two different slightly hipster greasy spoon restaurants have occupied the spot since the Fontana closed, but they haven’t managed to make a go of it. One painting I did when I first came to this apartment in the early 90s was done on crummy paper. I like the changes its undergone, sort of the way some old masters paintings cracked and darkened, before the fad came around of restoring everything.